Report by Miguel Rivera. Photography by Ray Kasprowicz. Jason Andrada comes out the aggressor. Andy Singh looks more passive than we’re used to seeing him in the ring. He does a good job, however, countering with push kicks and crisp overhand shots. Jason is visibly the bigger fighter. He does most of his damage in the clinch, which is something that has always been the chink in Andy’s armor. After catching Singh’s kicks, Andrada has two opportunities to sweep Andy but to no avail. Singh shows Jason how it’s done, however, trapping Andrada’s kick and sweeping his legs out from underneath him. A pretty close round to score, it could have gone to either fighter. Seems like no matter how much you miss or your attack is blocked, in this sport, you still get an “A” for aggressor on the score cards. In my opinion, Andy landed the more solid shots. Jason’s kicks sounded more like slaps – meaning that he was connecting with his instep more than with his shin. When it comes to judging, Las Vegas seems to be a place with different strokes for different folks. In the next round, Jason continues to be the aggressor. He brings the fight to Singh. At first, Andy matches Andrada blow for blow but eventually begins to slow down, while Jason maintains a torrid pace. Singh doesn’t so much look tired as overwhelmed. Andrada takes the fight relentlessly to Andy. 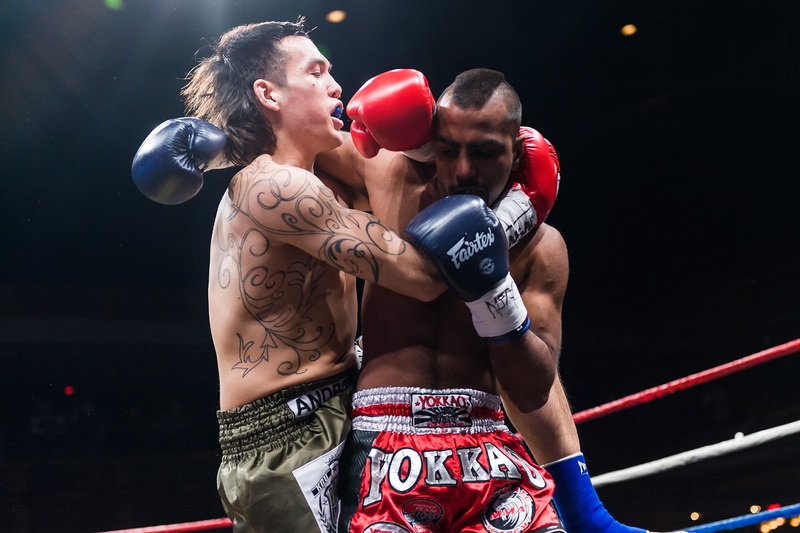 Singh has his moments in the fight – where he lands an overhand right and a flush jumping knee to Andrada’s chest – but Jason just eats it and swarms all over Andy with punch-kick combinations. Andrada throttles forward in his momentum, mixing up the attacks. It’s the pressure that throws Singh off his game, where he’s used to seizing the initiative. Andy seems like he’s beginning to fade but – towards the end of the round – he lands overhand rights and leg kicks. Jason sticks to his fight plan with head, body and leg kick combinations. Both fighters finish the round very strong. Fast forwarding to the final round, the two of them are swinging for the fences. Singh lands some solid punches, but Jason has a very strong chin. Andy has found his mark all night with the overhand right but was unable to slow down Jason, who’s relentlessly strong pace all five rounds was the message in this media. “As ye sow, so shall ye reap.” Andrada wins a Unanimous Decision. Kevin Ross starts off a lot faster in the rematch than he did first time against the Canadian. Not too aggressive, Kevin takes his time and picks his shots. He lands solid kicks inside, finishing hand combinations with kicks. Matt Embree has always been known to be a slow starter. He also picks his shots but does his most damage in the clinch. It looks like Matt wants nothing to do with Ross on the outside, in the next round, constantly pulling Kevin into the clinch. Ross dumps Embree not once but twice out of the clinch. Kevin continues to do his damage from the outside. He seems just a bit too fast for Matt’s timing. Embree stays with his game plan. He pulls Kevin into the clinch but this time punishes Ross with elbow after elbow and knee after knee, neutralizing The Soul Assassin’s attack. This is – or should have been – a solid round for Matt Embree. Round Four is pretty much a stalemate. Neither fighter seems able (or willing) to solve the other’s puzzle, not Ross from the outside nor Embree from the inside. 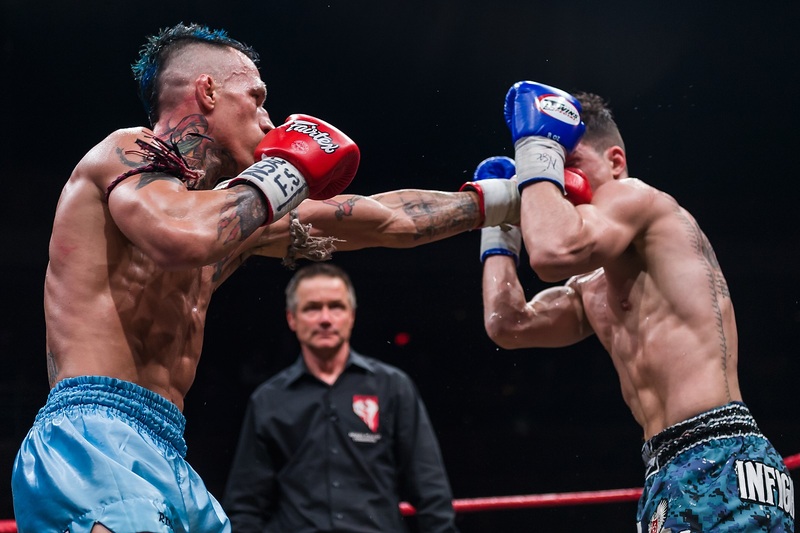 The final round goes through the same motions, leaving it for the judges to decide, one of whom always casts a blind ballot on the premise “when in doubt, give it to the home team.” At the end of five rounds, Kevin Ross gets the Split Decision. 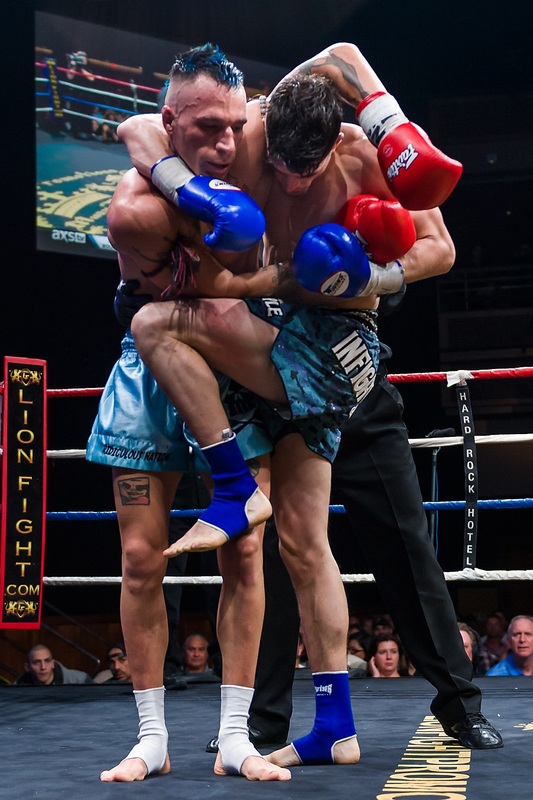 It’s obvious that these refs need to be schooled on the clinch difference between boxing and Muay Thai. There were way too many early separations by both Mazzagatti and Tony Weeks. There are no sports, where one size fits all. Both champ and contender pretty much feel each other out in the First Round. Neither does any visible damage. Both are just looking to find their range. Next round starts off the same, until they go into the clinch. Caley dominates. Her knees crush Tiffany’s ribs. She controls Van Soest in the clinch, until of course Referee (and ex-boxer) Tony Weeks separates them. Tiffany Van Soest then lands a beautiful spinning elbow. The only problem is that it puts Tiffany right back in Reece’s grasp, where her ribs take a pounding from the Aussie’s knees. In Round 3, Van Soest finds her groove. She moves in and out, landing punches and kicks that avoid Caley’s clinch. It works for Tiffany at first, but Reece uses her longer reach to chop at Van Soest’s legs. The Aussie then cuts the ring, making it possible for her to pull Tiffany back into her clinch, where she does effective damage. Both fighters get the crowd’s adrenaline pumping in this round. In Tiffany’s most aggressive round, Van Soest puts her combinations together. She closes the gap to cut off Caley’s range with the ole “stick and move”. Reece works the clinch, where she’s dominant. Both fighters are solid in the final round. Tiffany is very aggressive on the outside. Caley also lands from the outside but mostly scores on the inside. At the end of five rounds, Caley Reece is the new Lion’s Fight Champion by Split Decision. I agree with the decision in the Singh vs Andrada fight. For the first time, I saw a less aggressive Andy Singh. I’m not sure why, but he is one of the best out there, and I look forward to seeing him come back. Here’s what I don’t get. In the Van Soest vs. Reece fight, Caley did most of her damage in the clinch. So did Embree to Ross. While both Kevin and Tiffany scored on the outside, Reece didn’t do anything special on the outside. Neither was she as aggressive as Van Soest. So I’m guessing that she won on the criterion of damage in the clinch. If that’s so, how did Matt Embree lose a technically similar fight, where he also did very little on the outside but had his way with Ross in the clinch? Let’s also do a smell test on referees, who have no clue how to police the clinch. They must have boxing OCD to break up every clinch without regard to the action inside. 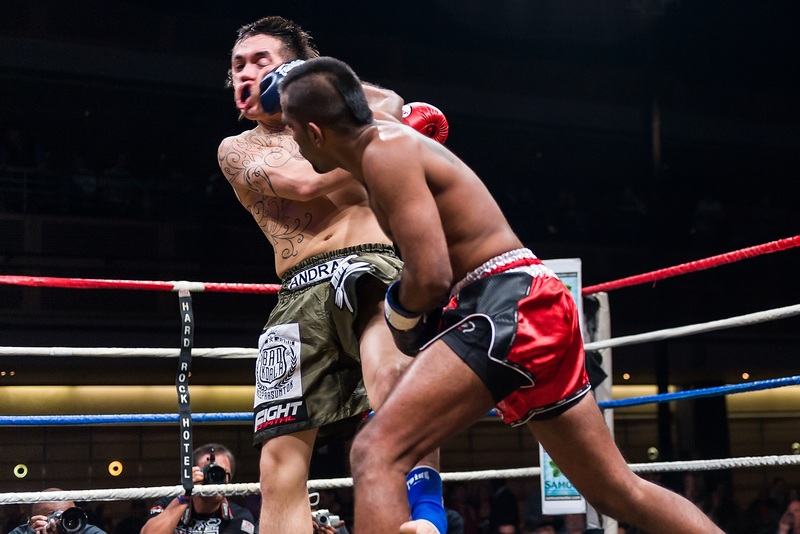 Hey refs, it’s Muay Thai not boxing. 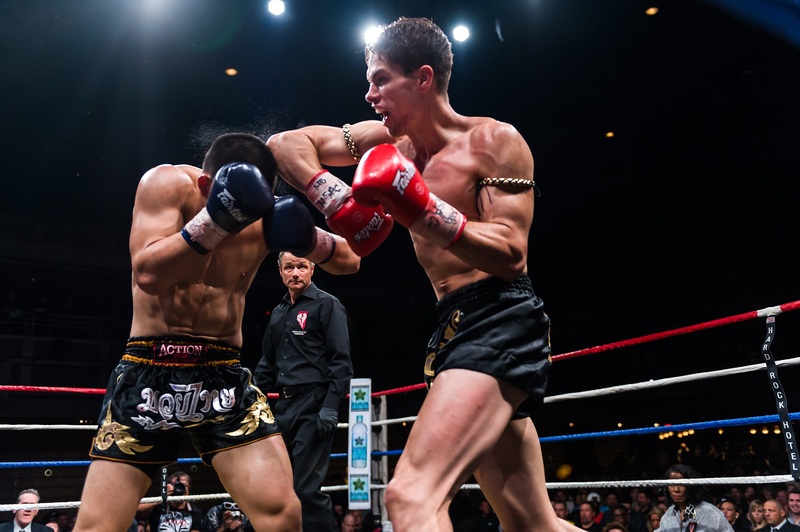 Let the fighters fight by the rules that apply to Muay Thai. 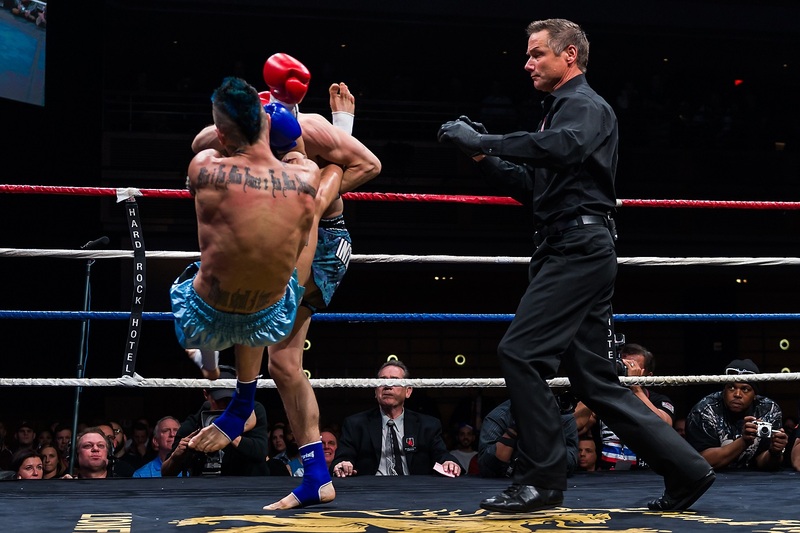 Next time you get some vacation time, go to Thailand and learn what REAL Muay Thai refereeing is all about. Last but not least, I’ve really got to wonder who among these judges is going rogue and why. Coke Chunhawat (San Francisco by way of Thailand) def. Rami Ibrahim (New York City by way of Palestine) in a Unanimous Decision. Nick Chasteen (Tempe) def. Jonathan Del Rosario (Los Angeles) in a Unanimous Decision. Josh Shepard (Las Vegas) def. Daniel Kim (SF) in a Unanimous Decision. See Ray’s Photo Gallery HERE. 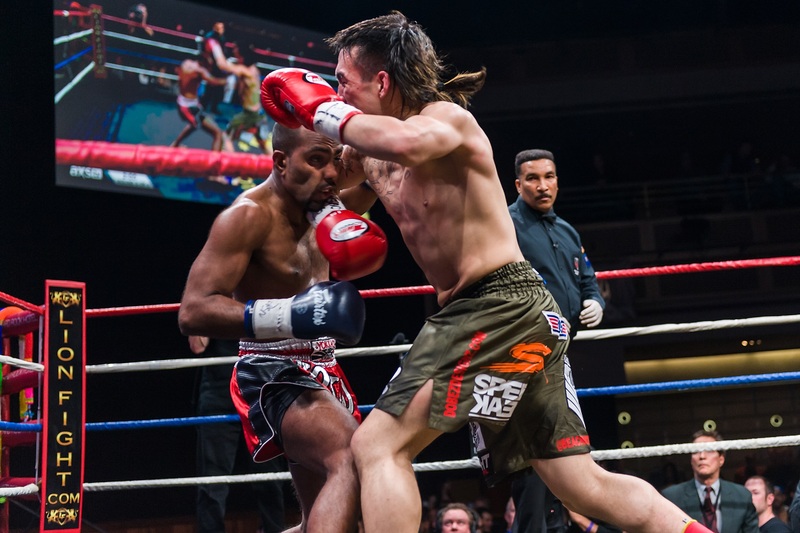 This entry was posted in Features and tagged Andy Singh, Caley Reece, Coke Chunhawat, Daniel Kim, featured, Jason Andrada, Jonathan Del Rosario, Josh Shepard, Kevin Ross, Las Vegas, Lion Fight 13, main featured, Matt Embree, Most Featured, Muay Thai, Rami Ibrahim, Tiffany Van Soest. Bookmark the permalink.